I tend to like modern-day books that take some new angle on a classic, at least if they’re well-written. Valerie Martin’s Mary Reilly, for instance, which shows the Jekyll/Hyde household from the point of view of a housemaid, or Peter Carey’s Jack Maggs, which uses the viewpoint of the convict in Great Expectations to tell its story. But I’ve grown a little leery of Pride and Prejudice spinoffs, partly because there is such a plethora of them. Even the great P.D. James, though ably creating a mystery out of the Darcys’ post P&P life in Death Comes to Pemberly, was not really up to recreating the particular sparkling wit of Austen, and I’m not convinced that anyone else is either. 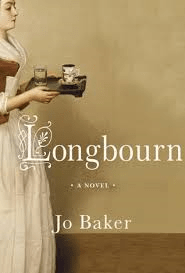 Wisely, though, Jo Baker doesn’t attempt that kind of afterlife for Elizabeth Bennett in Longbourn. The chief focus of the story is Sarah, a housemaid at Longbourn, the Bennetts’ home, and though there is occasionally humor in some of the goings-on in the servants’ quarters, it is generally not of the sparkling variety. “Beasts, they are, the lot of them, don’t you think? Just animals…To be milked and fleeced and made into bacon,” he said. Well, that last is a bit more easily said than done, but it is definitely not a view of the Bennetts and the Bingleys and Darcys of this world that you will find gracing the pages of Austen’s own novels. And I suspect that how well one takes to the social critique that rings out through Baker’s own pages will have a good deal to do with how well one likes Longbourn in the end. It punctures a certain easy dream we have about the world of Austen’s creation. Put another way, I wonder how popular shows like Downton Abbey or Upstairs Downstairs would really be if they were told primarily about the servants’ life with only passing reference to the more exquisite life of the gentlemen and ladies? Lest you get the wrong impression, Baker herself is a fan of Austen, and claims that her love of Pride and Prejudice survived even her own dissection of it. The novel cleverly mirrors some of the themes of its great precursor and it’s interesting to note that in some ways it doubles the stakes. The Bennetts may be worried about Mr. Collins, presumptive heir of Longbourn, but the staff depends on his approval of them for their future livelihood. And though Mrs. Bennett may worry about getting her daughters suitable husbands, the choices of the serving women are even further prescribed. Indeed, although the stifling of desire is a crucial element in many of Austen’s works, it would seem to be child’s play when compared to the lack of options for many in the servants’ quarters here. Baker says in her Author’s Note that her characters are but ghostly presences in Pride and Prejudice—“they exist to serve the family and the story”. In a similar way the Bennetts and their class are ghostly presences in Baker’s book as well. Some of the secondary cast does have a larger role to play, though—fans of the detestable Wickham, if fans there are, will get their fill of him here as well, and I believe that Baker may be the first writer to render Mr. Collins at least somewhat sympathetically. In fact, Mr. Darcy, in his brief appearances, comes off rather less well.